Earlier this year state lawmakers passed a so-called reform measure which proponents claimed would "end the bounty system" (paying contractors based on the number of tickets) and address concerns about errors by creating an "ombudsman" for each local speed camera program. However correspondence with a representative of Montgomery County reveals that neither thing has actually happened. Insurance Company AAA Mid Atlantic, an organization with a long history of supporting speed cameras, praised and took credit for the reform bill. In 2010 AAA's Lon Anderson was quoted by the Washington Post as taking credit for the legislation which authorized statewide speed cameras in Maryland. In a similar fashion, AAA took credit for the reform legislation. AAA claimed that the legislation, which went into effect June 1, was "Ending the Bounty System". AAA's press release promoting Maryland Speed Cameras also stated "The law also requires each jurisdiction in the state with such a program to appoint an ombudsman to resolve and void erroneous citations before the motorist goes to court to prove his or her innocence and to respond to citizens’ complaints, questions, and concerns about the program". The term 'Ombudsman' is often defined as "a commissioner who acts as independent referee between individual citizens and their government or its administration" and many people construe the term to mean an individual who has a degree of independence from a program and who is capable of being objective. The term has been widely used with respect to this reform legislation in news reports, press releases, and legislative testimony by Montgomery County, and in previous correspondence from the county. During legislative hearings Captai Tom Didone, the Head of Montgomery County's traffic enforcement division, had introduced Mr Richard Harrison as the county's "ombudsman" to the state legislature, using that term. However when asked about his duties, Richard Harrison three times rejected the use of the term "ombudsman" to describe his role. 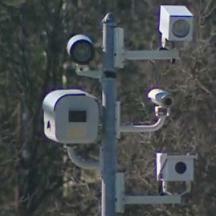 "OMBUDSMAN -- is not a term that is used in the Speed Camera Reform Act of 2014." stated Harrison in a letter dated July 2014. In response to a second letter, Harrison wrote again in a letter dated September 2, 2014. "Ombusman is not a term that is used in the Speed Camera Reform Act of 2014. We use the term local designee." In response to the question "Do you believe it is the Role of Montgomery County's "Ombudsman" to be an independent advocate for the public when addressing complaints regarding the Safe Speed Program that are of a systematic nature, or is your role to defend the county's position even if that position conflicts with the people's legal rights?" Harrison responded "As I have stated above I am the Local Designee, not an ombudsman." ... "It is my role, as the county's local designee and as a county employee, to objectively carry out these duties and responsibilities imposed on the Local Designee by law." More of a "YesMan" than an "Ombudsman"
In the same letter, Harrison responded to the question about "Who is the current Program Manager for the Montgomery County Safe Speed Program?" that he is the Safe Speed program manager, and he confirmed that Captain Tom Didone is his immediate supervisor. The September 2 letter was in response to questions the Maryland Drivers Alliance had asked regarding statements made by Captain Tom Didone. Therefore in Montgomery County it is up to the Program Manager of the program to "objectively" investigate such a complaint about the program which he himself manages, as well as any questions about the actions or statements of his immediate supervisor. In any event, by Harrison's own statement, Montgomery County most certainly has no "ombudsman". Harrison also responded to a question about Montgomery County's current "Bounty System" contract. Harrison confirmed that Montgomery county still pays their contractor on a per ticket basis. Harrison stated that the county has until June 2017 to comply with the change. Harrison stated that the Procurement and County Attorney's office was looking at options for a new contract arrangement, including "tiered pricing". "Tiered Pricing" arrangement would essentially pay the vendor for *batches* of tickets, or use some other formula based on ticket volume to compute the fee, rather than paying a flat fee. Thus it would still be based on ticket volume, and is in fact the very definition of being "contingent on the number of citations issued or paid". Thus the goal of making is to contractors are not incentive to issue more tickets is not satisfied, rather it is legitimized. Only the words "per-ticket" would be changed, not the fact that they would be paying their contractor based on ticket volume. 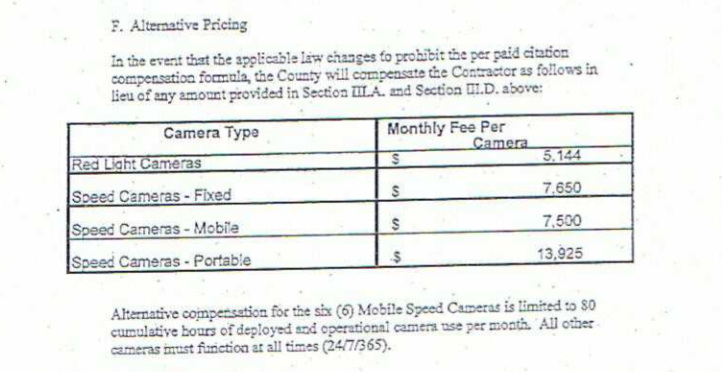 In 2011, Montgomery County added an amendment to their speed camera contract which would immediately switch the payment structure from $16.25 per ticket to a flat fee per camera if the legislature passed legislation closing the loophole permitting per-ticket payments. However Montgomery County has apparently elected not to exercise this provision and ACTUALLY "end the bounty system" immediately and completely, even though they have the contractual means to do so at any time. We previously reported how another speed camera contractor, Brekford, had cheered about how the changes to the law would not affect them, because they had locked in new long term contract extensions which would allow them to continue "bounty system" contracts for years to come. So far we have not found any local governments which paid their contractor based on ticket volume at the time the "reform" legislation was passed which have actually switched to a flat fee. Before the reform legislation, there was an existing provision of the law which stated "If a contractor operates a speed monitoring system on behalf of a local jurisdiction, the contractor’s fee may not be contingent on the number of citations issued or paid." It was the legislative intent, as stated in the fiscal policy notes that payments to contractors not be made based on the number of tickets issued however Montgomery County found that they could circumvent the previous wording of the law by not using the term "operate" to describe what the contractor does and rendering the provision ineffective. "Bounty System" contracts based on a loophole which Montgomery County invented soon became the norm in much of the state. The legislation claiming to "end the bounty system" reworded the language from stating "operates" to "administers or processes citations", but then changed the language from "contingent on the number of citations" to "contingent ON A PER TICKET BASIS". It therefore does NOT end all payments based on the number of tickets, but rather legitimizes payments based on ticket volume so long as it is not a fixed dollar amount for one single ticket. Since existing contracts were grandfathered in until mid 2017, the promises being made about "ending the bounty system" do not need to be kept until long after, and thus the manner in which they will create new loopholes to continue paying based on ticket column-- need not be made public until years later. And since the state's speed camera law contains no outside oversight and no enforcement mechanism for its requirements, local governments are free to be as creative as they wish in their efforts to do so without having to be concerned that such loopholes will be deemed illegal. Most press releases about the "end of the bounty system" (including those by AAA) have cleverly redefined the term "bounty system" (which isn't actually a term any contract uses) to only say it ends an explicit single payment for a single ticket, and not include all other types of arrangements based on ticket volume. The "reform" legislation was drafted by a secret legislative workgroup, which the head of Montgomery County's speed camera program Captain Tom Didone says he was a member of. Didone has not responded to requests for information about this workgroup's membership, meeting agendas, or minutes. (Some organizations have and reporters have noted that it is becoming more common for the legislature to create temporary workgroups to discuss controversial legislation and exempt those meeting from Maryland's "sunshine laws"). By the time the legislation was dumped on the house committee floor, the committee had not intention of hearing from the public. Sponsors told motorists who came to testify that they already knew all their was to know about speed cameras, and Vice Chair James Malone stated that "today is "me too' day" (using those words) and that those attending should "just say 'Me Too.'". The Maryland Drivers Alliance did not say "me too", but instead stated that the legislation was filled with loopholes and contained only cosmetic changed which would not address the problem. Montgomery County is apparently determined to prove us correct.